This entry was posted on November 14, 2016 by Texas Safety Supply. Cut resistant Gloves By Jaguar Gloves are great cut protection gloves. Jaguar Gloves are well known for their built in top notch quality. Jaguar Gloves are manufactured by the same company as the world famous Joker Impact Gloves for use in the oilfields for impact resistance for those that work in oil and gas related jobs. Jaguar has recently developed several styles of some of the best cut resistant gloves available on the market today. Purchasing Agents are aware that Texas Safety Supply has the best prices available for Cut Resistant Gloves due to large volume purchases and a close working relationship with Jaguar Gloves and Joker Gloves. 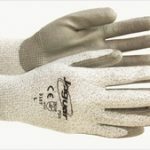 There are several benefits in purchasing Jaguar Cut resistant Gloves from Texas Safety Supply. First, we have the best pricing available in the country. Second, we are a highly Responsive supplier for your Cut Resistant Glove needs. Third, large quantities and supplies of Jaguar Cut Resistant Gloves that are available to ship the same day as ordered. Fourth, place an order of more than $200 and the shipping is on us. Finally, for large buyers that make volume and bulk glove orders, Texas Safety Supply provides additional safety glove bulk pricing. What follows is some additional info about some of the best cut resistant gloves available. Jaguar 3135 is a clear favorite of many Safety managers and more importantly the employees that wear them. Comfortable to wear while providing the needed cut protection. The front of the glove and the fingers are dipped in a unique Nitrile blend that helps to prevent cuts and abrasions from handling sharp objects. Having the correct process for doing the job are of critical importance and should have a safety training process that is ongoing. Clearly an additional step is to provide the proper cut protection gloves for those exposed to handling sharp objects. The Jaguar 3135 Cut resistant glove does just that by providing ANSI Cut Level 4 protection for the wearer. The Nitrile coated blend goes over the top of a High performance cut resistant yarn. The great thing about Jaguar 3135 Nitrile Coated Cut resistant gloves is the great dexterity that the wearer still has. Nitrile lets people do their job in an efficient safe manner that keeps them safe and free from hand injuries resulting from Cuts and abrasions. 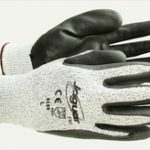 The Jaguar 3133 gloves is a favorite of many in the glass handling business. 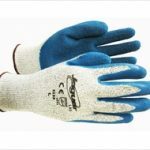 Jaguar 3133 again offers some of the Best Cut Resistant Glove properties that are needed in the Glass handling business. A latex crinkle cut coating on top of a high performance yard provides the good solid grip to prevent slipping that is needed by those in the Glass handling cut resistant gloves, metal fabrication cut protection gloves and Roofers cut protection gloves. The High performance yard provides Cut Level 4 protection for the user. The yarn is a grey blend that hides dirt and extends the life of these cut resistant gloves. The "Crinkle Cut" grip means that it is not a smooth palm, but instead a palm with multiple ridges throughout the Latex dipped cut resistant gloves that many users prefer for a better grip. The Jaguar 3137 is a Cut protection level 4 again offering some of the best cut resistant gloves available for safety managers who want maximum protection and for Purchasing agents looking for Great prices and volume price discounts on safety glove purchasing. The Jaguar 3137 is a Cut level 4 glove with a Polyurethane coating on top of a Grey high performance Yarn. The grey yarn is light weight and yet it breathes to provide the user cut protection without making the glove so hot and warm that it becomes difficult or sweaty from wear. Polyurethane coated gloves are the best choice for those handling small objects, small electronics, or tiny screws, washers and bolts while assembling products. Polyurethane cut resistant gloves are the perfect choice and another great Cut resistant Glove by Jaguar cut resistant gloves. If we can assist with any of your needs related to cut resistant gloves or to Industrial Safety Supplies in general, please contact our office at 214-764-3527.